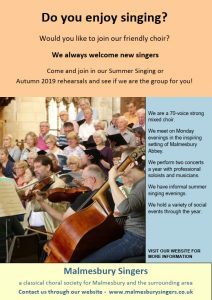 The Malmesbury Singers is a friendly mixed choir, and has been a major feature in Malmesbury since 1961. 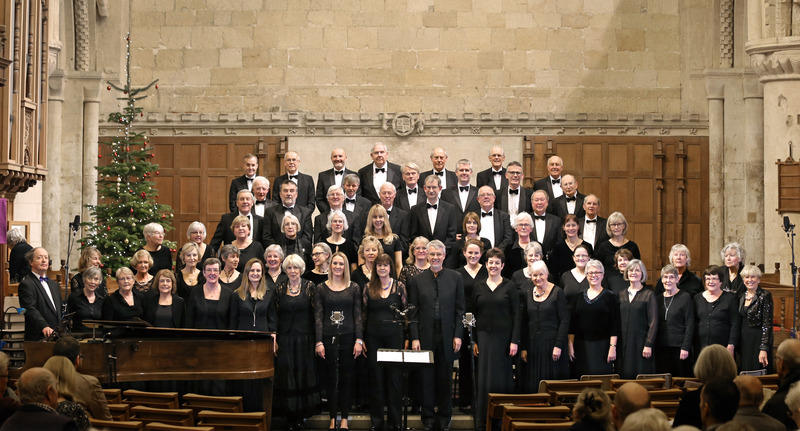 We are privileged to rehearse and perform in Malmesbury Abbey, an inspiring building steeped in the history of England and Wessex. We rehearse every Monday evening during term time (Spring and Autumn terms) from 7.30pm – 9.15pm in Malmesbury Abbey. We sing a wide variety of choral music to suit all tastes and perform regularly with full orchestra and professional soloists. Our most recent event was our Spring Concert, the Bach St John Passion. You can find out more by clicking this link. If you would like to consider joining us, please use the contact link above to get in touch. We offer a 50% discount on subscriptions for members under the age of 25. During the summer, we have a reduced choir and we shall be holding a series of four “singing evenings” simply to keep us from getting rusty! It’s often an ideal time to come along and try us out. Sessions will be held at the Kings Church, Abbey Row, Malmesbury; they are pay as you go, stand alone and at £5 per session, a bargain! Our next concert will be held on November 30 2019 in Malmesbury, when we shall be singing A Ceremony of Carols by Benjamin Britten and When Icicles Hang by John Rutter. In September 2018 we hosted a workshop singing day with the talented Nigel Perrin. Do check out our “Events” as new things are added from time to time, or our Facebook page. If you have a workshop or a concert coming up in the area, please contact us if you would like to invite the Malmesbury Singers along! New members are welcome in all voices, (see a link to our news page above) so please use the contact page to get in touch!